VANCOUVER, BRITISH COLUMBIA--(Marketwired - March 25, 2015) - Asanko Gold Inc. ("Asanko" or the "Company") (TSX:AKG)(NYSE MKT:AKG) is pleased to announce the commencement of a near mine exploration program focused on high priority targets that have the potential to add oxide resources to the Asanko Gold Mine using systematic and low-cost exploration methods. This follows positive results from an extensive regional prospectivity mapping exercise undertaken in 2014 by external consultants. The Asankrangwa Gold Belt and wider Kumasi Basin in Ghana are well endowed and contain a number of large economic gold systems such as Nkran, Esaase and Edikan. Significant potential exists for Asanko to generate further value on its ground holdings as demonstrated with the recent discovery of the Dynamite Hill deposit. The study concluded that only 7% of Asanko's highly prospective concession area had been historically explored effectively. 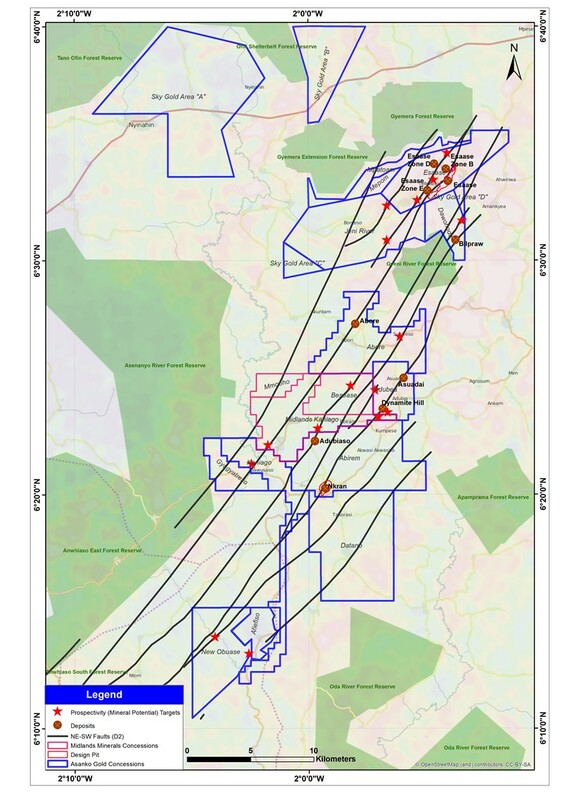 The study has provided a better understanding of the controls on the location of gold deposit formation and the expression of these controls in exploration data and a significant number of new exploration targets have been generated. The identified targets provide a clear opportunity for the exploration team and offer the potential for rapid delineation of new deposits and resource areas. Peter Breese, President and CEO, commented: "The results of this extensive prospectivity mapping program are extremely encouraging and highlight the potential of the Asanko concession area to host further gold deposits that can be efficiently brought to account. Our expectation is that a significant portion of these additional discoveries may be oxide resources which will provide opportunities to optimize the throughput of the three million tonnes per annum Carbon-in-Leach processing plant, currently being built as part of Phase 1." In February 2015, the Company acquired various concessions from Midlands Mineral Corporation ("Midlands") for a cash consideration of US$250,000. These concessions (refer to Figure 1 at the end of this release) are contiguous with Asanko's current mineral tenements and importantly extend the strike distance of a number of targets on Asanko's ground. The exploration data acquired with Midlands is being integrated with Asanko's exploration database, and near mine targets are in the process of being prioritized and validated. The 2015 exploration programme has been designed to provide a cost effective validation of the prospectivity targets, as well as establish a level of parity to the data coverage. To this end, an airborne geophysical survey is planned during Q2 2015, and will infill areas not flown already, and importantly lay the foundation for contiguous geological and structural modelling of targets. Near surface oxide targets are being prioritized for investigation during the 2015 programme, and will be ear-marked for initial drill testing during 2016. It is anticipated that the integration of the airborne geophysical survey results and current structural modelling will yield further near mine targets. The budget for the 2015 program is approximately US$2 million. Utilising data driven Weights of Evidence (WoE) and knowledge driven Fuzzy Inference System (FIS) prospectivity analyses to generate a significant number of new exploration targets. The provision of a detailed set of recommendations providing a framework for the development of future brownfields and greenfields exploration programmes. Benjamin Gelber P.Geo. Exploration Manager for Asanko, a qualified person with respect to NI 43-101, has reviewed and approved the content of this news release. For further information please visit: www.asanko.com, or email: info@asanko.com.